This year, instead of the marathon, RBARI is celebrating their 35th anniversary on September 21 with a "Party at the Shelter" in Oakland, NJ and I'll be a vendor at the event! They'll have food, music, pictures with your pet, shelter tours and other fun activities from 11:00 am to 4:00 pm. Well behaved dogs on leashes are welcome to attend. For directions and more info, visit RBARI's Anniversary Celebration page. I've been working on bandanas for Halloween, Autumn/Thanksgiving and Christmas, as well as cat- and dog-themed creations in anticipation of the anniversary party. 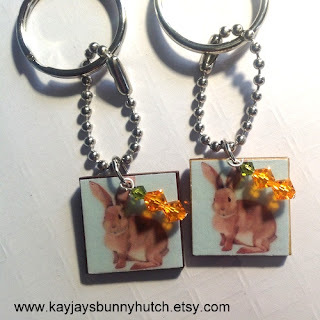 Kris, aka kayjaysbunnyhutch, will be joining me again and has created some pawfectly adorable charms featuring bunnies, critters and rescue. The following is a brief preview of some of the items that we'll have available at the shelter party. 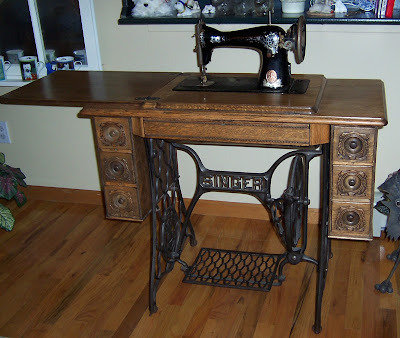 If you plan to come to the party and see something you'd like, please contact me and I'll be sure to hold it for you. 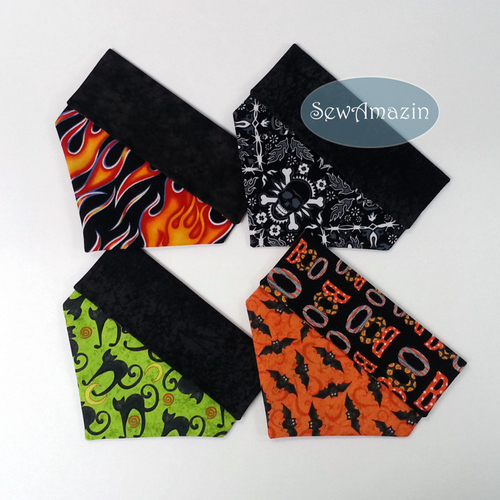 New Over-the-Collar Bandanas (clockwise from top left): Biker Bow Wow, Skullies, Halloween Boo! and Bats, and Halloween Black Cats. The last two are limited to one in each size (XS to XL) because they've been made with remnants left over from other bandanas. 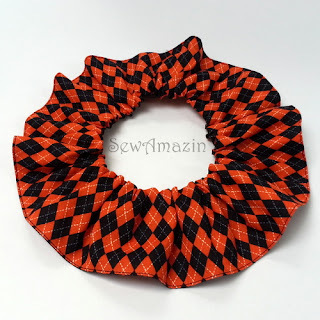 This style of bandana is made in-the-hoop using machine embroidery designs from DigiStitches. 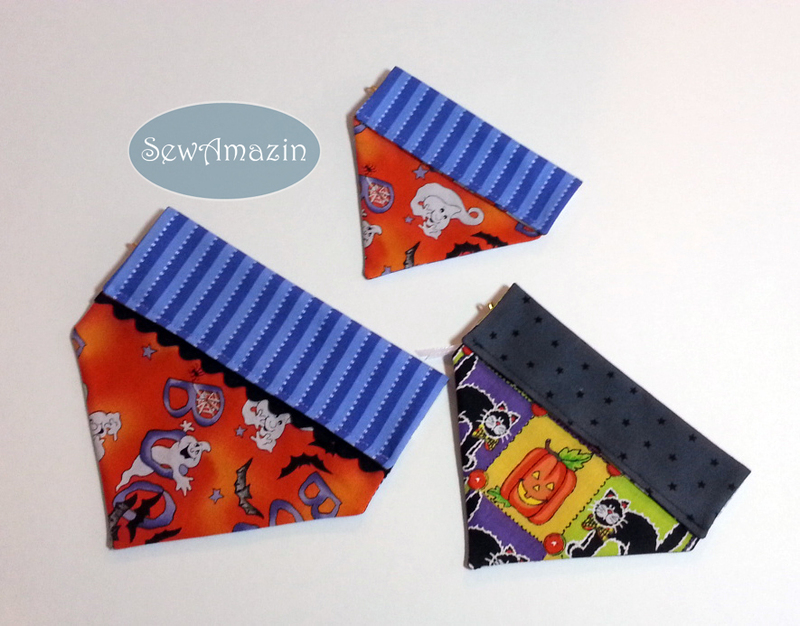 These Halloween Ghosts and Black Cats with Pumpkin Bandanas were made last year and are still available. 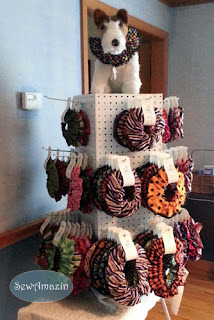 I've been re-thinking my table displays and have decided to use this rotating pegboard display for all the scrunchie ruffles. I've updated my packaging so that each ruffle has a wrap-around label made of cover stock, so the sizes are easy to read and they hang nicely on the pegs. 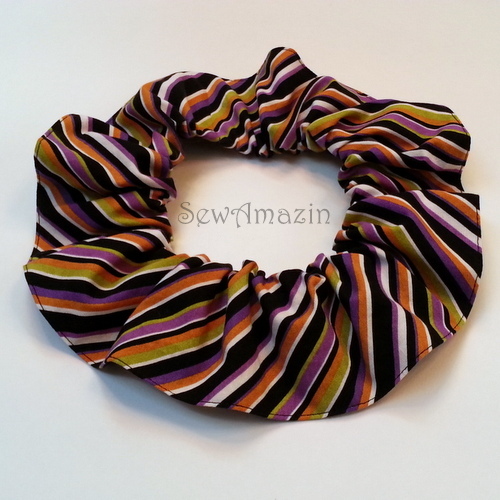 Do you like our new scrunchie 'model' sitting on top? I found him at the Goodwill store earlier this year. We're calling him Scruffy - he's the perfect size and has very realistic looking fur. I think he's a vintage stuffed dog, maybe a Fox Terrier? Still in progress is another 2x4 foot pegboard 'wall' that will be braced by my old scrunchie display racks and will be clamped on to one of my tables. Collar slipcovers, bandanas and some other items will probably go on this wall. This week, I'm working on new bandanas for Autumn, Thanksgiving and Christmas - I still have 10 days before the party to finish! A couple of new Puppy Dog Cases (and their matching coin purses and sunglass cases) have joined the pack. I'm calling them Cinnamon and Spot. 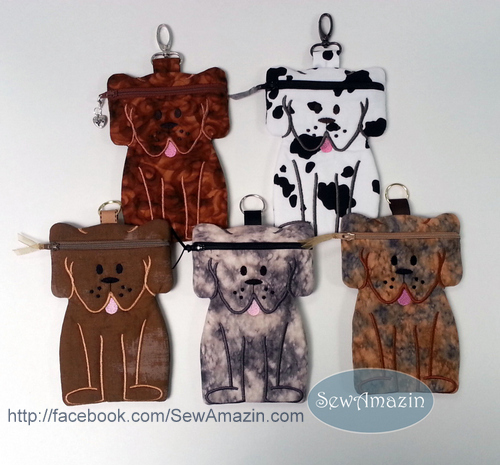 The others are Coco, Smokey and Butterscotch (currently listed in the Puppy Dog section of SewAmazin's Studio blog my shop on ArtFire my shops - link updated Dec-2016). 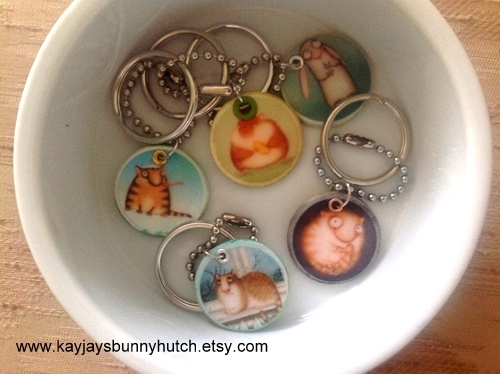 Did you know that September is Happy Cat Month? 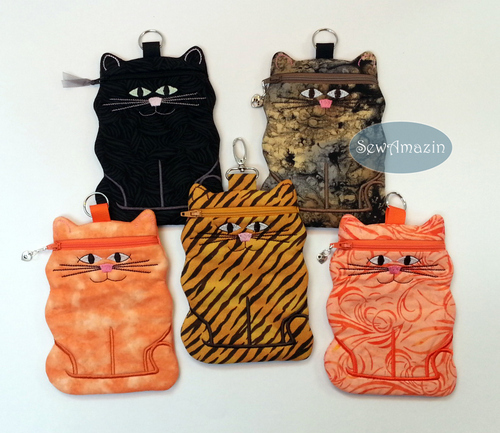 These Kitty Cat Cases (and matching coin pouches and sunglass cases) will also be looking for furever homes. The Black Cat has glow in the dark eyes and nose. The rest of the felines currently listed in the Kitty Cat section of SewAmazin's Studio blog (link updated Dec-2016) will also be with us at the party. 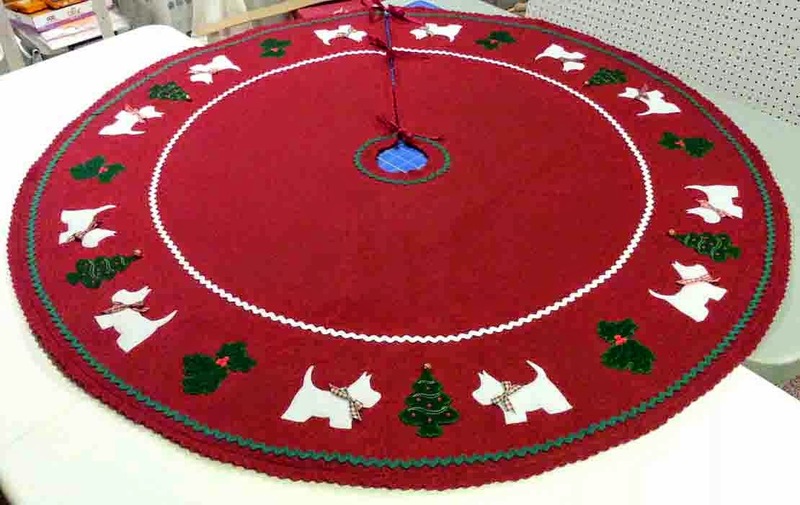 The Puppy Dog and Kitty Cat cases are made in-the-hoop using machine embroidery designs from Embroidery Garden. 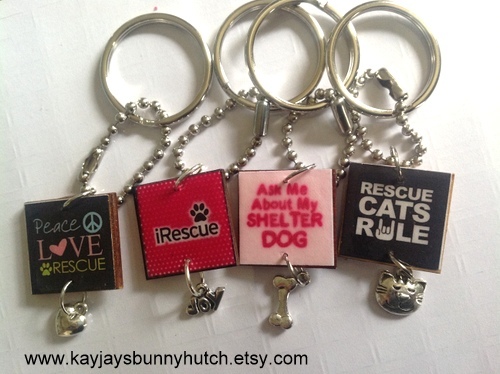 Here are some of Kris's creations - these Rescue themed key chains are adorable! 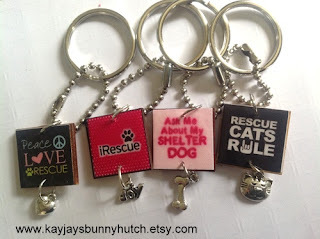 She has used small square tiles and added images with phrases like 'Rescue Cats Rule', finished with silver colored charms shaped like dog bones, kitty faces, hearts and more. These round charms with images of whimsical 'critters' have also been turned into key chains by adding ball chains and split key rings. These key chain charms have images of bunnies on square tiles and Kris has added a dangle of beads in orange and green, resembling carrots. 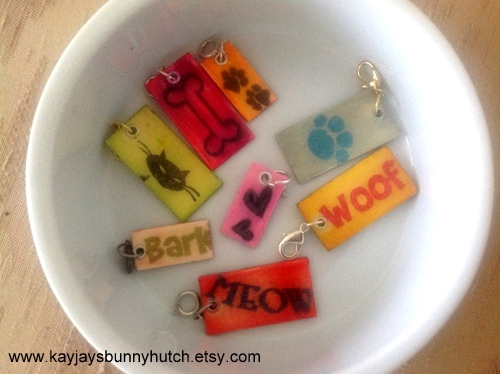 Dog and cat- themed balsa wood charms can be added to bracelets or necklaces, or used as zipper pull charms on bags. I'll have a small gift for the first 10 people who do so!